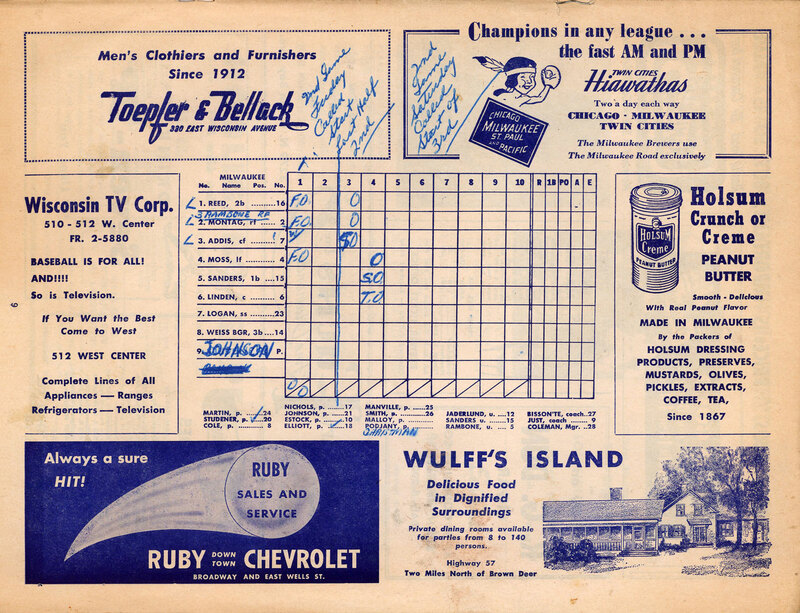 Today we examine a scorecard from 1950, the Brewers' fourth full season as a farm club for the Boston Braves. 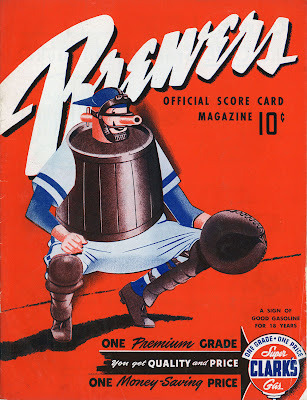 On the cover, the Brewers' beer-barrel-chested mascot Owgust, wearing catcher's gear, crouches and waits for a pitch. This image of Owgust wearing the "tools of ignorance" would be re-used for the team's 1951 pocket schedules. The interior covers are printed in two colors, red and blue; the rest of the scorecard features dark blue ink on the solid paper stock. 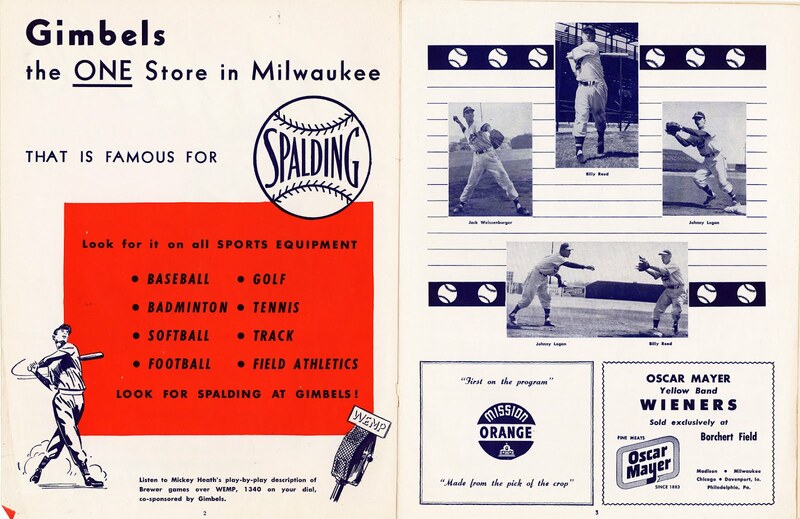 Milwaukee-based Gimbels department store was an important sponsor of the Brews. 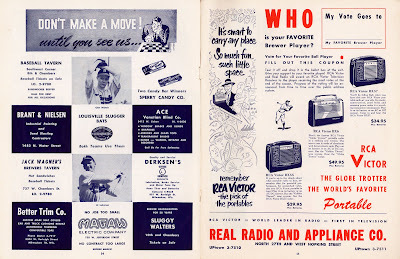 In 1950, they were sponsoring radio broadcasts of the games, with play-by-play man (and former Brewer player/manager) Mickey Heath. 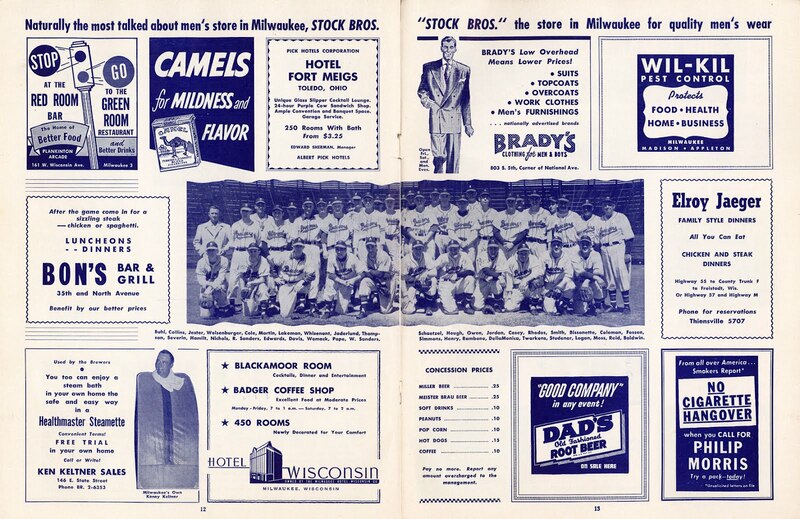 I'm intrigued by a couple things on this page: the Wisconsin semi-pro tournament held at the Orchard, and the photo of new manager Bob Coleman. Coleman, succeeding popular "tomato-faced" skipper Nick Cullop, was an institution in the Braves organization, having managed one of the Boston club's farm teams for eleven of the past fourteen seasons (the other three years were spent managing the Boston Braves club itself, a job he took over from the former Brewer manager Casey Stengel). 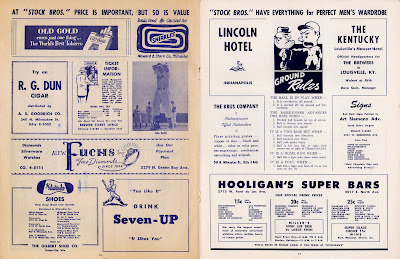 Of those eleven years, nine were with the Evansville (Indiana) Bees/Braves of the Three-I League. That's an Evansville uniform he's wearing—you can see the top of the Braves' distinctive wordmark and tomahawk—with something resembling Milwaukee's M airbrushed onto the cap. 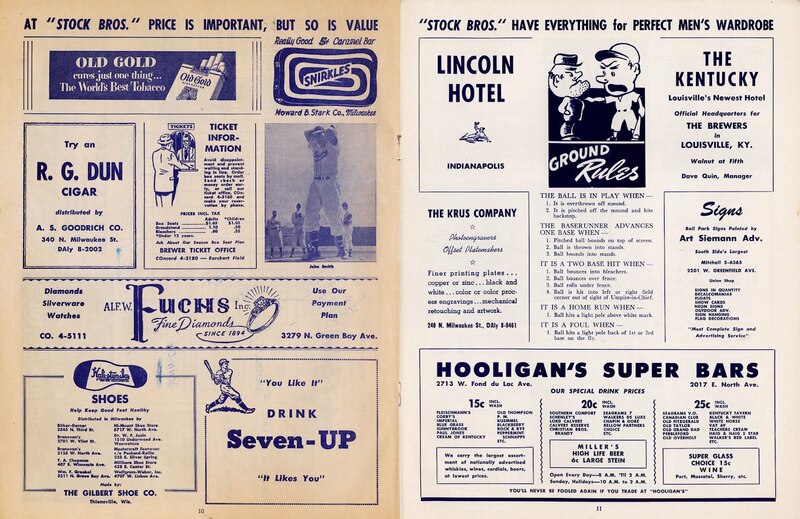 Also of note are the Brewers' scheduled home games at Borchert Field and a whole host of local ads. 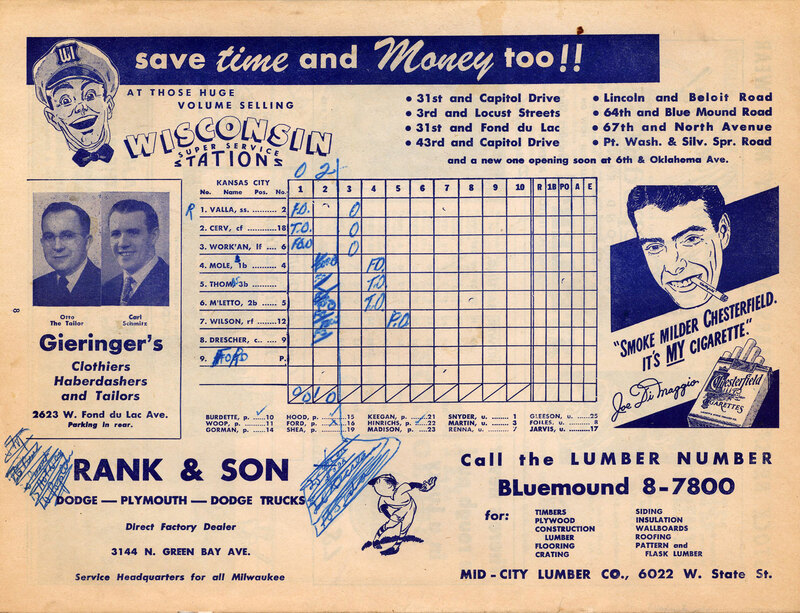 The darker tone indicates that we've reached the four-page newsprint insert with the scorecard for the specific game, starting with the lineup for the visiting Kansas City Blues. Love that Joe DiMaggio Chesterfield ad. 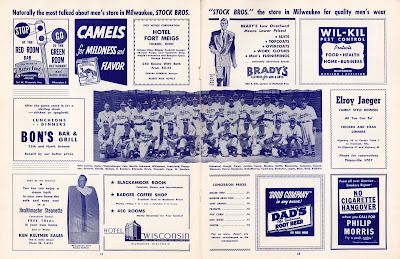 One player who would be a key figure in Milwaukee baseball to come is listed among the members of the Kansas City battery. Lew Burdette, then working his way up the New York Yankee farm system, would be traded to the Braves in late 1951 for pitcher Johnny Sain. Burdette went on to be a key member of the Milwaukee Braves' only championship, throwing three complete games (two of them shutouts) in the 1957 Fall Classic. One name jumps out— Johnny Logan. The spunky shortstop would go on to fame with the Milwaukee Braves, and in recent years has become the de facto representative of the Brews whenever they occasion demands one. He was listed as wearing #2 in 1948, but by this point he's in his customary #23. After that, more ads. Lots of them. 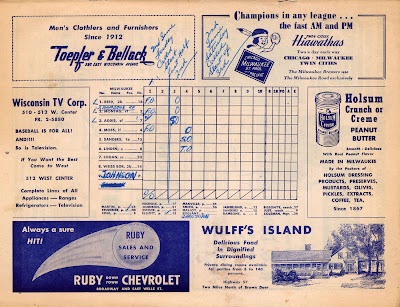 Scoring a ground rule double when "Ball is hit into left or right field corner out of sight of Umpire-in-Chief" refers to the infamous sightlines at Borchert Field. The next page has a marvelous photo of the Boys in Red and Blue in their Brewer flannels (and a couple wearing the "Milwaukee" roads). 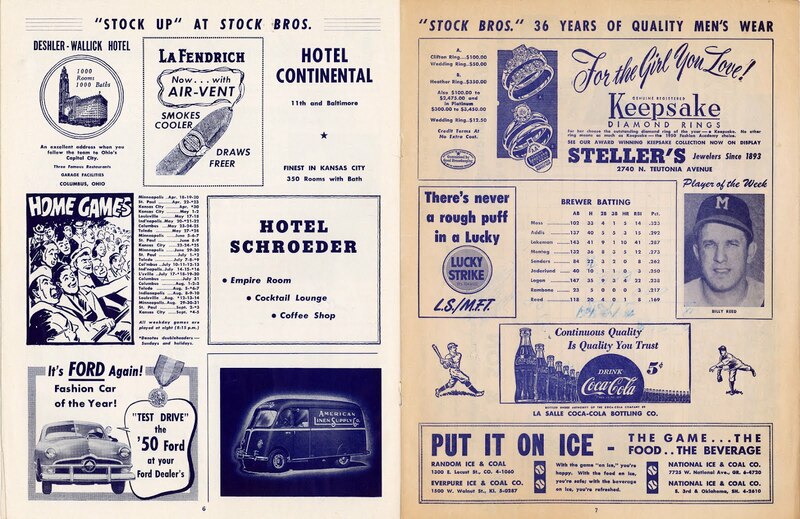 These tavern ads give us a good look at the neighborhood around the Orchard. Two bars across the street from the ballpark, and one just down the block—Baseball Tavern, Jack Wagner's Brewers Tavern and Sluggy Walters (the last one a official ticket outlet)—where thirsty fans could meet before, after or even during the games. 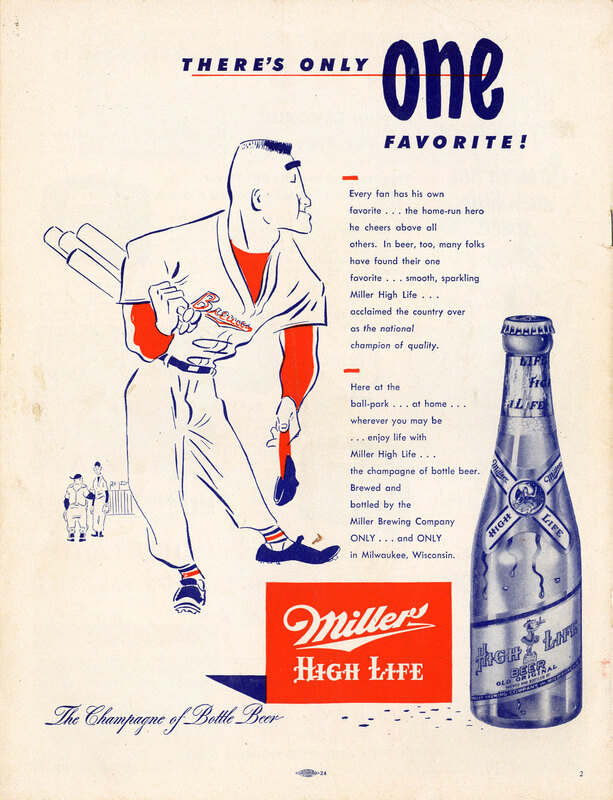 The back cover features an ad for Miller High Life (only 25 cents at the concession stand!) with a line drawing of a Brewer player. 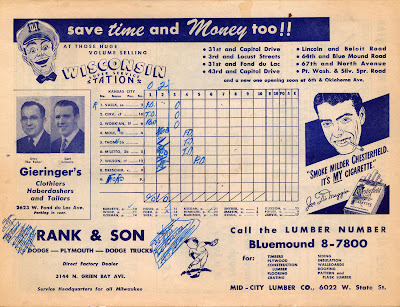 The crewcut man would also be featured on pocket schedules, just like the backstop Owgust on this score card's cover. Brewer fans likely needed a fair amount of that High Life, be it from the concessionaire or at Jack Wagner's, as the Brews limped to a 68-85 record. That .444 finish meant 6th place in the American Association, and ensured that manager Coleman would be back managing in Indiana before the first Wisconsin snowfall. 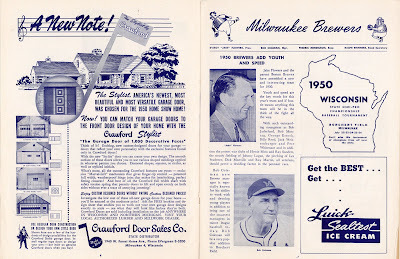 Boston Braves general manager John Quinn, looking to return his top farm club to its championship form, brought back former manager Charlie Grimm and longtime coach Red Smith as GM, setting the stage for a much-improved Brewer squad in 1951. Great stuff! I'd like to learn more about the amateur tournament as well some time. 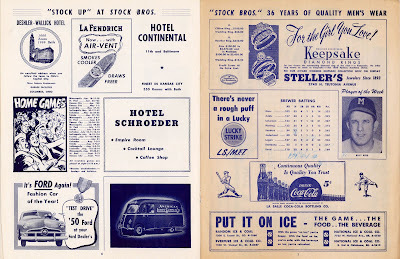 On the page with the team photo, the ad for the portable steamroom thing caught my eye. "Ken Keltner Sales"--I presume this is the ballplayer? It seems that Whitey Ford pitched that day. He started 12 games for KC in 1950.